2.0 megapixels HD CMOS sensor, Realize 1080P HD-AHD real-time output. 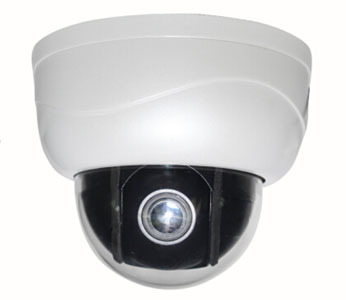 4 PCS IR-III Dot Infrared Lights.Indoor IR distance can reach up to 45-50M. PTZ Function, Pan:350°; Tilt:70°; can remotely control the direction of monitoring, and the scope of monitoring is wider and the control is more flexible. 2.5' Metal shell shape with beautiful appearance,Humanized structure design, easy to adjust and install; IP66 waterproof and dust-proof grade, fully adapt to various indoor and outdoor scenes. 4 PCS IR-III Dot Infrared Lights. Indoor IR distance can reach up to 45-50M; Design with intelligent light-activated and automatically detecting technology to control the infrared lights, reducing working hours of the light and extending product life in an energy-saving and environment-friendly way. It has basic but significant function such as Automatic backlight control (BLC),automatic gain control (AGC) and automatic white balance (AWB) also provides WDR,smart IR,etc. Single color or color to black functions can be setup,adapt for different needs of more monitoring sites. Back Light compensation(BLC),high light compensation(HLC) function,reverses the area about strong light,adjust the contrast of object,to light balance. PTZ Function, Pan:350° continuous,0-25°/s;Tilt:70°,0-20°/s;220 Preset positions,3 groups cruising scan( each group 16 preset,dwell time and speed selectable); can remotely control the direction of monitoring, and the scope of monitoring is wider and the control is more flexible. Elegant 2.5' metal shape with user-friendly design, beautiful appearance, easy to adjust and install. IP66 waterproof and dust-proof grade, fully adapt to various indoor and outdoor scenes. IR-CUT switch consists of IR cut-off filter and all spectral through filter..When the IR cut-off filter on, it can block infrared wavelengths which affect the imaged badly at the light sufficient day time, above 95% 700nm infrared can be cut-off, then the CMOS can produce accurate color images, get more pure and softer picture, finally make consistent with human vision.At night, the IR cut-off filter will auto switch to spectral through filter while the light insufficient, then CMOS make full use of visible light to improve performance of low illumination, reduce the noise, clarify the image.